Andrew – Pride Lafayette, Inc. 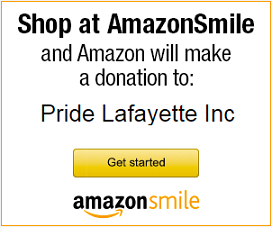 Pride Lafayette would like your feedback! Click here to access our 2016 Pride Community Survey and let us know how we’re doing, where we can improve, and what you’d like us to focus on as an organization! The October issue of The WORD is now available at the Community Center! Stop by and pick up a FREE copy today! The September issue of The WORD is now available at the Community Center! Stop by and pick up a FREE copy today! The August issue of The WORD is now available at the Community Center! Stop by and pick up a FREE copy today! The July issue of The WORD is now available at the Community Center! Stop by and pick up a FREE copy today! The June PRIDE issue of The WORD is now available at the Community Center. Keep up with pride celebrations in Indiana and surrounding states. The April edition of The Word is now available at the Pride Center. It will not be available at Robots and Rogues as they are closing and moving to another location down Main Street under new ownership. Stay tuned. Due to the approaching inclement weather and deteriorating road conditions, the Community Center will be closed tonight (January 11). Stay safe and stay warm!